Where do I use my Collectif voucher code? Established back in the year 2000 as a stall in one of the world’s most exciting and unique retail destinations; Camden Market, London, for over seventeen years, Collectif has grown to open 3 stores in London and Brighton. Collectif now produces all their own clothing which is divided into 2 individual lines, Collectif Vintage and Collectif Mainline. The lines both represent their heritage with the Vintage line reflecting style from the 40’s and 50’ and the Mainline representing pin-up and alternative culture style. Everything you find at Collectif is versatile and boasts a unique combination of new fashion trends with classic vintage styles along with a splash of rock and roll! Don’t hesitate to use one of our money-saving Voucher Codes to help you save money off your next order at the checkout either. At Collectif, they believe that collections are more than just a fashion statement, they’re about creating timeless glamour! Collectif customers are at the heart of everything the specialist team do at Collectif. From design to production, the dedicated team work tirelessly to ensure their customers receive only the highest quality products along with a personalised shopping experience. The Flared Dress is one of the most iconic styles associated with vintage fashion and at Collectif, they proudly stock an expansive selection of glamorous styles including 1950’s full skirts to 1960’s chic mini dresses and so much more. In true flared fashion, every dress you find at Collectif boasts a stunning flared skirt. Flared dresses are perfect for creating a vintage look and each and every one you find at Collectif is bold and beautiful and will keep you rocking and rollin’ all night long. Whether you’re looking for a full-skirted swing or a flared mini dress for an unmistakably 60’s style, look no further than the Collectif Flared Dress collection. The perfect way to complete any look in your vintage-inspired wardrobe is with a Vintage Accessory. From those small finishing touches like vintage jewellery, pinks, retro sunglasses or stylish stockings, to those all-important essentials like a stunning pair of vintage shoes! This unique collection is sure to complete your retro look so search no further than right here and make sure you turn your outfit from subtle, to stand out! 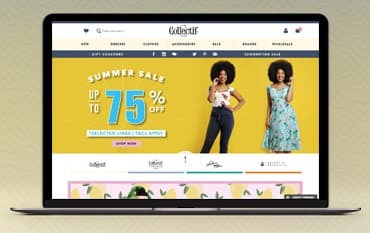 Collectif is the online destination for celebrating vintage fashion and bringing you modernised interpretations along with classic styles, boasting a wide selection of statement dresses and those all-important sunglasses and heels to compliment your look. Shop Fitted, Flared and Maxi styles dress featuring bold & unique patterns and save money when you buy online using one of our Collectif Voucher Codes. See what Collectif can do for you now whether you’re a lover of the 40’s & 50’s flair or 60’s chic, Collectif is your one-stop-shop!